There are two things I like about it: 1) it’s a clean aesthetic and 2) it does not hinder people with color or contrast eyesight issues. 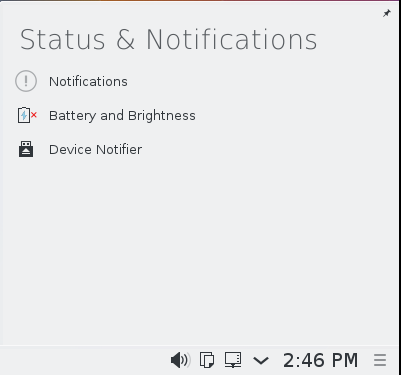 On the taskbar they’ve taken some steps to reduce clutter. 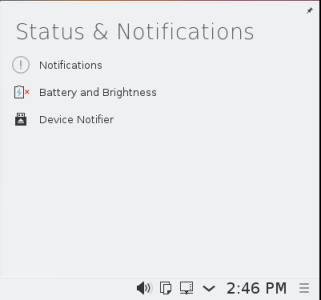 I currently have mine hidden on my KDE 4 desktop as I find it useless for all but knowing the time, but I did find myself sometimes thinking there was a bit too much clutter in the past. Here you can see that a number of previously separate sections have been joined into one. Clicking on either of those tells you about them. Sure, it’s one more click than it was before, but it does save screen real estate. I certainly appreciate that the activities menu is now vertical. I think it makes more sense with the way we’re used to dealing with information on a screen. It does so. 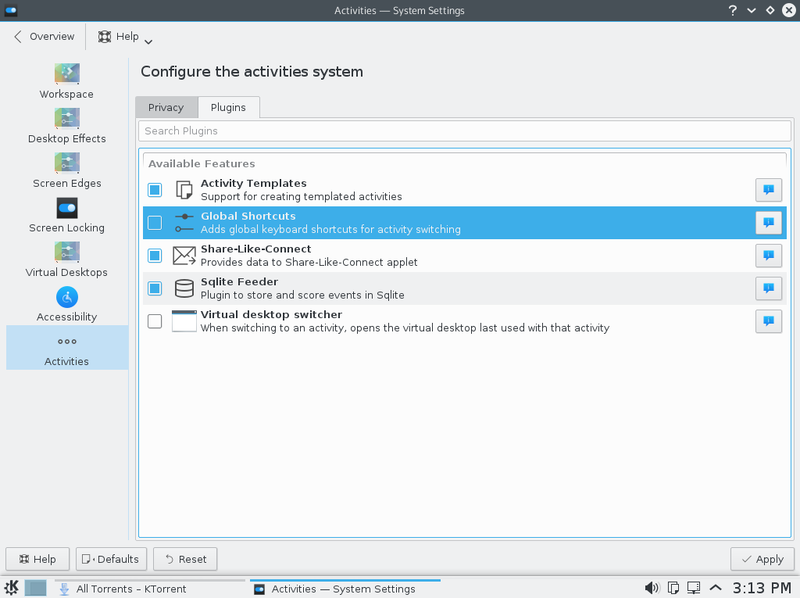 Interestingly, it does not ask about templates as it does in KDE 4. I’m not sure if this is to simplify things or simply hasn’t been readded. I tried to add a new wallpaper from the “Download Wallpapers” button, but the wall paper service get an API error. So I download one of my own so I know which desktop I’m on. 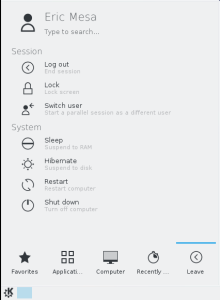 I try the shortcut key for switching activities, but it appears to be mapped to a different set of keys than it is in KDE 4. It should be the same key. I’m going to chalk this up to the fact that it’s a VM. 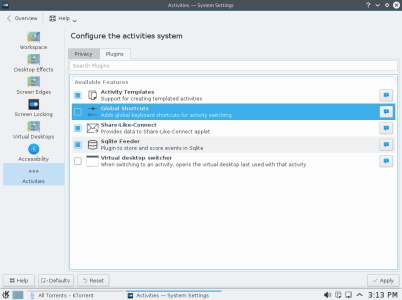 So if I look at the current KDE 5 offerings, I can do some of this. But I’m missing some stuff. The Ktorrent widget isn’t there. The Quicklaunch isn’t there (although I can add in the icons one at a time as separate widgets). Again, the API isn’t working for getting new stuff. (And the internet’s working – that’s how I got a new background for my second activity). I think they still haven’t added my wishlist item: different numbers of virtual desktops per activity. I think that would make activities WAY more valuable for me and possibly even make it make sense for those who still don’t get the point. 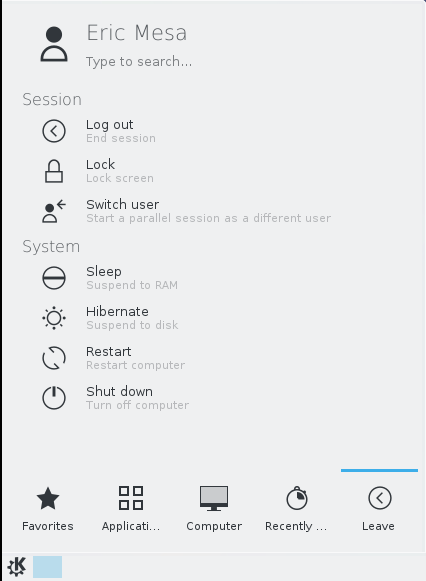 When I’m compiling software I might want a half dozen virtual desktops so I can have all my Konsole windows maximized, but for my regular activity I might only want 2 or 3. 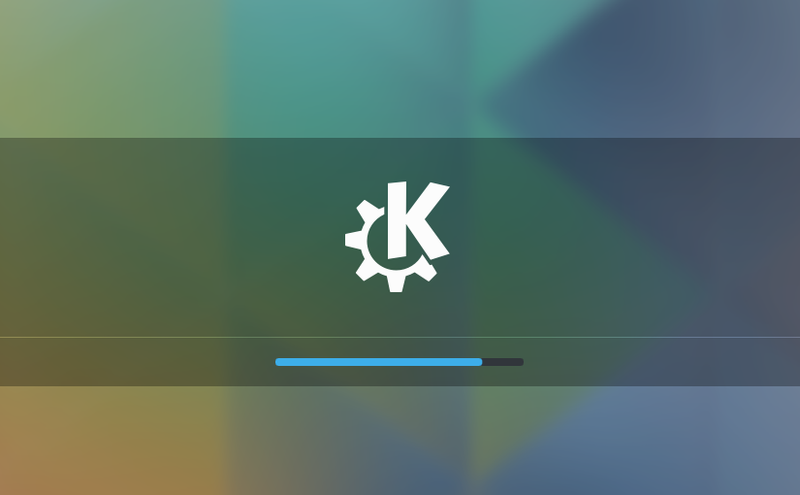 Overall, nearly everything about KDE 5 seems more professional and polished than KDE 4 which was more polished than the cartoony KDE 3. 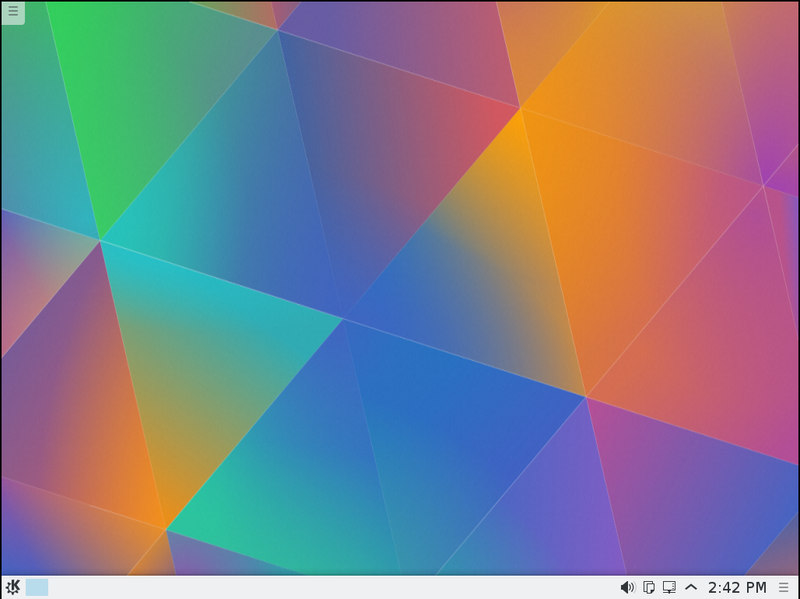 Overall, I’m pretty excited for Fedora 22 to land with KDE 5. I’m going to miss some of the widgets. (I also make heavy use of the Kate and Konsole widgets) But I’m sure some of those will reappear soon enough. Overall, KDE 5 seems to be in a much better place at 5.3 than KDE 4 was at the same time. Just curious, did they still require the ridiculously hard password setup during the install that was present in the alpha? Can you elaborate? Seemed exactly the same as it’s always seemed. The Fedora install process is one of the least intuitive as it’s stateless rather than steps one after the other. Sure. I have always been able to use a random word that i came up with years ago (sure, probably not the most secure, but it IS pretty random). During previous installs (fedora 21 and earlier), it would complain that the password was too simple, but would still let me use it. Its a silly thing to complain about I know (there is already a bug for it too, btw) but IMHO it is a bit of a pain to have to type a password like that for everything that I need sudo / su for. Please understand, btw, I am not complaining. I am excited about the release as well. Okay, I couldn’t wait and did a virtualbox install. Seems they are once again allowing bad password (yay). Sorry for all the clutter on the blog. No worries. Glad to hear they’ve fixed your issue!